It has been so hard being away! The good news is that we have found a new home. The bad news is that it will still be a month and a half before we are moved in. I'll post pictures soon! With a month and a half ahead of me, I've decided to re-open the shop and start designing again. The conditions aren't ideal, but I'm antsy to get going again. I'm excited to start posting about new projects as well as future projects for our new home. I'll need plenty of feedback from my wonderful readers regarding all of the decisions that will need to be made in our new place. In the mean time check out this great summer DIY project from MADE. 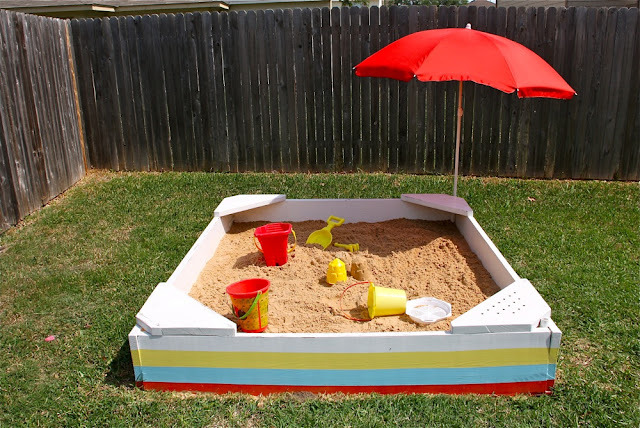 Isn't that the cutest sandbox you've ever seen? We have the perfect corner to place this amazing sandbox in our new backyard. Can't wait to get started on that!